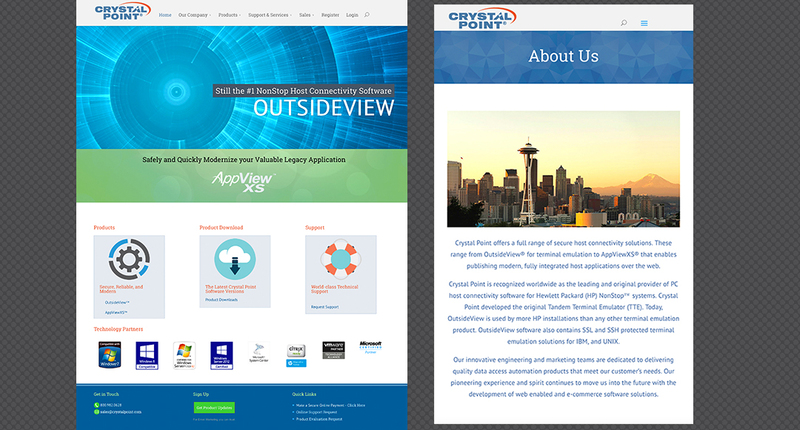 New fresh and friendly looking responsive WordPress website for Crystal Point a software company located in Washington State that sells a unique software product – Terminal Emulation. The project had a lot of very specific requirements, one of which was to build this WordPress website for a custom Windows Server and it also had to integrate with a custom coded secure back end that was not based on php (which is a standard for WordPress). Custom elements were coded by the software companies Engineers while Rosepapa Creative and team worked on the design, development and condensing years of content into a user friendly, easy to update website. In addition there are multiple forms that had to be created (Gravity Forms), video libraries, extensive documentation, online support, online purchase, downloads and more. While the site looks simple on the front end, we had to work through several hurdles! Final results can be seen here.